Composed by Keith Getty. Arranged by Stuart Townend. Choral. Sacred Anthem, Christ the King, Eastertide, General, Lent, Palm/Palm-Passion Sunday. Octavo. Lorenz Publishing Company #10/3805L. Published by Lorenz Publishing Company (LO.10-3805L). 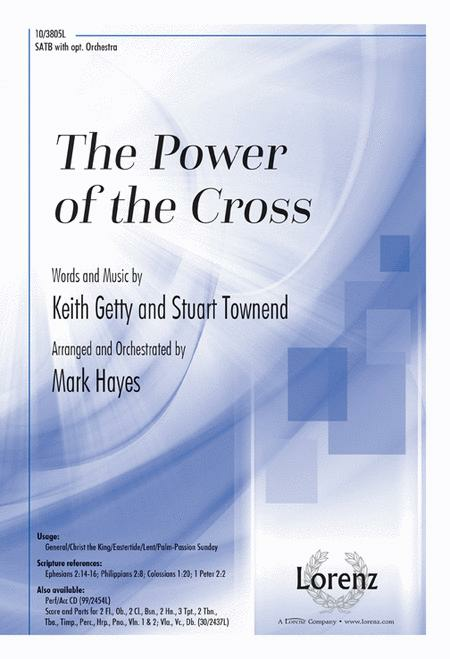 This arrangement of Keith Getty's magnificent hymn, In Christ Alone, eclipses its precursor as a transcendent witness to the power of the cross. Subtle vocal counterpoint illumines the prosaic verses, and signature Hayes harmonies lead the charge to a powerful, unforgettable ending. June 14, 2018 What a stunning piece. This song is well-written and was attainable for my High School Concert Choir. The lyrics are both touching and convicting. The piano part and orchestration are very hard. You may want to order the accompaniment CD so that you do not stress your accompanist out. , The Power Of the Cross will transform you.